Attaches to power equipment easily: Uses Skid Steer Universal Quick Hitch design for quick and easy attachment. 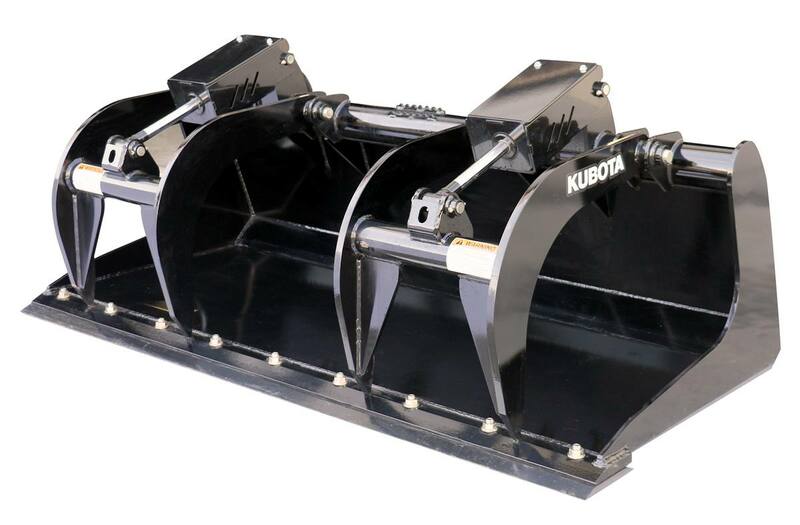 Designed to fit skid steer loaders: The quick attach plate mounted Grapple Bucket can be attached to a wide variety of machines. 1 1/4" greasable pivot pins: Large diameter pins for extra strength. Two independent upper grapple jaws: Able to secure uneven loads. Heavy-duty construction grade: Built to withstand rugged use in commercial grade applications. Weld-on cutting edge: Strengthens leading edge of bucket. Optional bolt-on cutting edge: Bolt-on cutting edge is reversible to extend the life of the blade and replaceable to extend the life of the Grapple Bucket and its weld-on cutting edge. Bucket bottom: Retains small objects such as dirt, gravel, crushed rock, etc. Optional hose shields: Protects cylinders and fittings. Optional cylinder shields: Protects cylinder rod. Grapple jaw opening: 40 1/2"
Bucket side wall thickness: 1/2"
Bucket cutting edge thickness: 1"
Working depth of bucket: 37 1/2"
Upper grapple tooth thickness: 3/4"